Poor Man's Fire Chai: Cheaper than Starbucks. Don't get me wrong, I love my Starbuck Soy Chai. But, on a thirsty, chilly day, you can end up spending ten bucks a day on special coffeehouse, frothed up, cutesy named chai lattes. Poor Man's Fire Chai. It's hot! And, you can drink it in your PJ's and slippers since you don't need to leave the house. Yes! Here is an awesome recipe for my unique chai that will knock your slippers off! ...and save you some money. 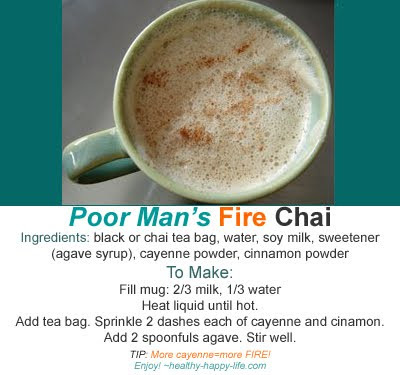 Get more heat for your buck with my simple recipe for Poor Man's Fire Chai. a mug, soymilk, sweetener, spices, water and a basic tea bag. The secret ingredient is the cayenne. It adds a spicy kick that blows any Starbucks chai blend out of the water. Fill mug: 2/3 milk, 1/3 water. Tip: More cayenne, more fire!